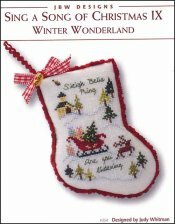 Sing A Song Of Christmas 9: Winter Wonderland [G1898] - $8.00 : Yarn Tree, Your wholesale source for cross stitch supplies. Cross stitch pattern by JBW Designs. Here the sleigh bells ring?!?! Santa & his reindeer must be on their way! A sled filled with presents sits on the snowy country hillside with a church standing in the background. A reindeer is leaping through the hillside, making footprints in the fresh snow. Evergreens stand in the hillside, decorated with snow. It's a "Winter Wonderland!" Stitch count 47W x 67H. Stitched on #2181 Zweigart Belfast Linen 32ct. Antique White.